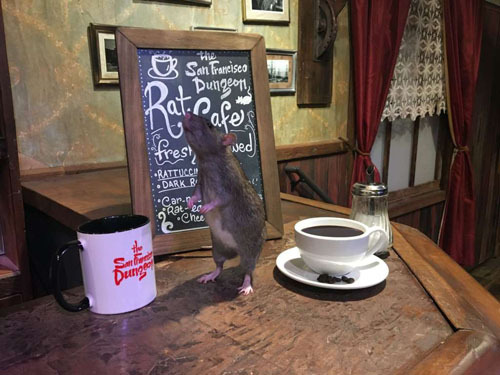 The San Francisco Dungeon is hosting the cafe. Jokes aside, the rats are all sourced from rat rescue nonprofit, Rattie Ratz, based out of Clayton. The rats are assumed to all be well-behaved, and should one of the “Ambassador Rats” strike your fancy and you find yourself wanting one as a pet — Rattie Ratz also does adoptions. Someone get the news to Bill de Blasio. We have a solution to New York City’s rat epidemic. Just get moonbats to “adopt” them. Looks like the rat left some treats on the saucer.